Epsilonproteobacteria is a class of Proteobacteria. All species of this class are, like all Proteobacteria, Gram-negative. 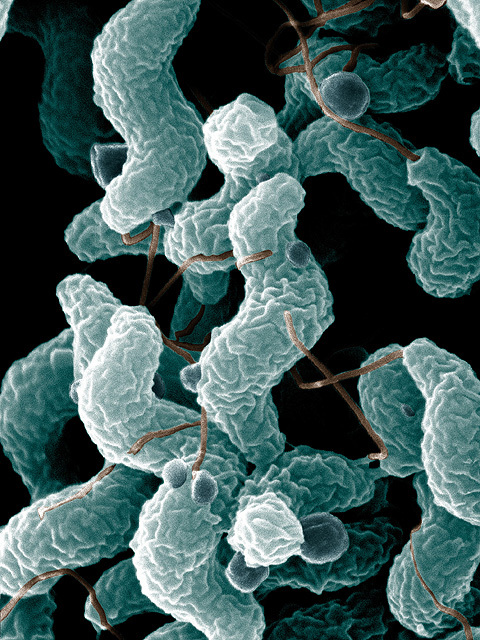 Epsilonproteobacteria: Campylobacter bacteria are the number-one cause of food-related gastrointestinal illness in the United States. To learn more about this pathogen, ARS scientists are sequencing multiple Campylobacter genomes. This scanning electron microscope image shows the characteristic spiral, or corkscrew, shape of C. jejuni cells and related structures. The Epsilonproteobacteria consist of few known genera, mainly the curved to spirilloid Wolinella spp., Helicobacter spp., and Campylobacter spp. Most of the known species inhabit the digestive tract of animals and serve as symbionts (Wolinella spp. in cows) or pathogens (Helicobacter spp. in the stomach, Campylobacter spp. in the duodenum). There have also been numerous environmental sequences of Epsilonproteobacteria recovered from hydrothermal vents and cold seep habitats. A member of the class Epsilonproteobacteria occurs as an endosymbiont in the large gills of the deep water sea snail Alviniconcha hessleri. Often the epsilonproteobacteria living in hydrothermal deep sea-vents exhibit chemolithotrophic features, and they are able to meet their energy needs by reducing or oxidixing chemical compounds. Helicobacter is a genus of Gram-negative bacteria possessing a characteristic helix shape. They were initially considered to be members of the Campylobacter genus, but since 1989 they have been grouped in their own genus. The Helicobacter genus belongs to the class Epsilonproteobacteria, order Campylobacterales, family Helicobacteraceae and already has more than 35 species. Some species have been found living in the lining of the upper gastrointestinal tract, as well as the liver of mammals and some birds. The most widely known species of the genus is H. pylori which infects up to 50% of the human population. 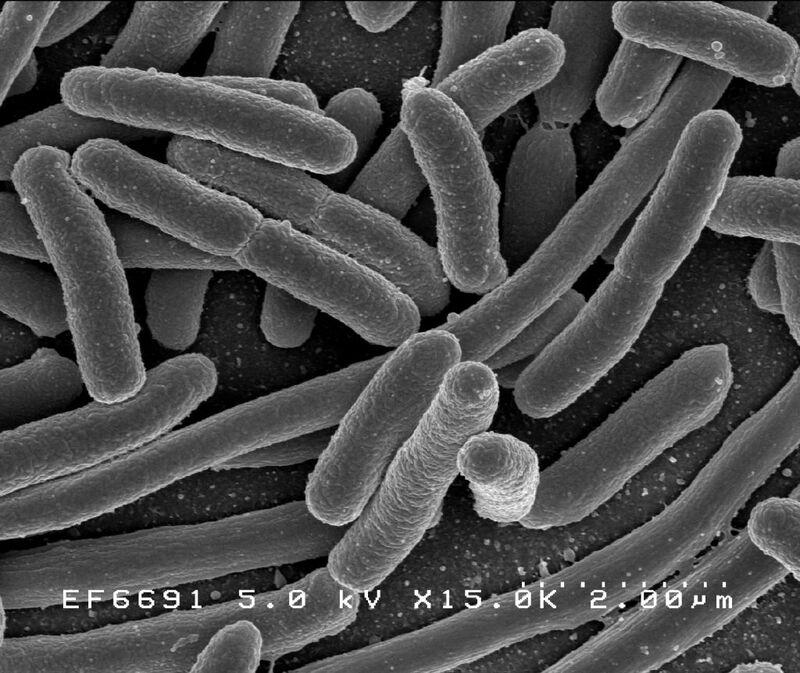 Some strains of this bacterium are pathogenic to humans as it is strongly associated with peptic ulcers, chronic gastritis, duodenitis, and stomach cancer. It also serves as the type species of the genus. The Epsilonproteobacteria consist of few known genera, mainly the curved to spirilloid Wolinella spp., Helicobacter spp., and Campylobacter spp. Most of the known species inhabit the digestive tract of animals and serve as symbionts (Wolinella spp. in cows) or pathogens (Helicobacter spp. in the stomach, Campylobacter spp. in the duodenum). There have also been numerous environmental sequences of Epsilonproteobacteria recovered from hydrothermal vents and cold seep habitats. Gram-negative: Gram-negative bacteria are bacteria that do not retain crystal violet dye in the Gram staining protocol. In a Gram stain test, a counterstain (commonly safranin) is added after the crystal violet, coloring all Gram-negative bacteria with a red or pink color. symbionts: Symbiosis is close and often long-term interaction between two or more different biological species. Epsilonproteobacteria: Epsilonproteobacteria is a class of Proteobacteria. All species of this class are, like all Proteobacteria, gram-negative.